Chris Corning, of the United States, jumps during the men's slopestyle qualifying at Phoenix Snow Park at the 2018 Winter Olympics in Pyeongchang, South Korea, on Feb. 10. Why: Because all three Summit County boys have a shot at one last Olympic medal. Seventeen-year-old Red Gerard, 18-year-old Chris Corning and 20-year-old Kyle Mack all reside in Silverthorne, and all three have the tricks to medal in this round, which will be scored using the best combined two scores out of three attempts. Gerard will drop in first of the dozen big air competitors after he qualified with the lowest score in the qualifying round. 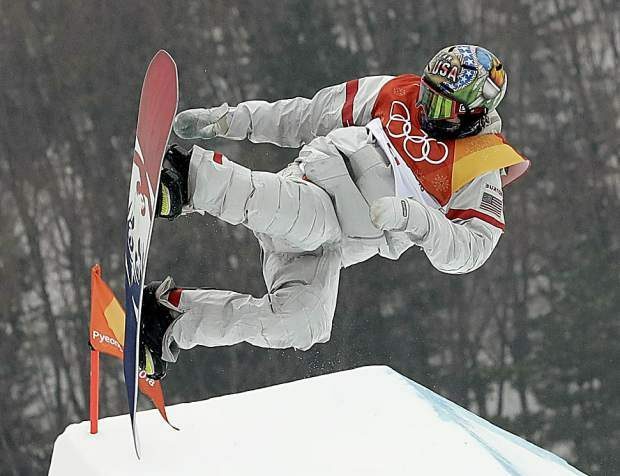 The West Bloomfield, Michigan-born Mack will drop in seventh, and will be the final American rider to post a score before the heavy-hitting international group comprised of medal favorites Mark McMorris of Canada, Niklas Matsson of Sweden, Jonas Boesiger of Switzerland, Max Parrot of Canada and, the final rider, Carlos Garcia Knight of Switzerland. After a qualifying round where many snowboarders attempted similar versions of the same trick (a backside triple cork 1440) look for these riders to showcase a lot more variety in order to get the attention of the judges. It’s no secret many of the best riders, including Corning, held back their biggest and best tricks for the final. And if Corning is able to stomp his boldest trick, a backside quad cork 1800 (four inversions, five spins), he will be right in medal contention. Why: Because this is the first time a mixed-alpine team event will ever take place at an Olympics. The event will consist of 16 teams taking part in eight first round heats before the knockout format gives way to quarterfinals, semifinals and a gold medal match — all back-to-back-to-back Friday night. Four skiers will take part from each country — two women and two men — competing against other national teams in a series of head-to-head slalom races. Why: Because, though they may be “rejects,” these are our star-spangled rejects. And they are at the icy doorstep of history. The United States’ men’s curling team, comprised of skip John Shuster, Tyler George, Matt Hamilton and John Landsteiner, defeated Canada early Thursday morning (MST) to advance to take on Sweden in the gold medal match. Whatever happens on Friday night, the red, white and blue is assured its best finish ever in the event.